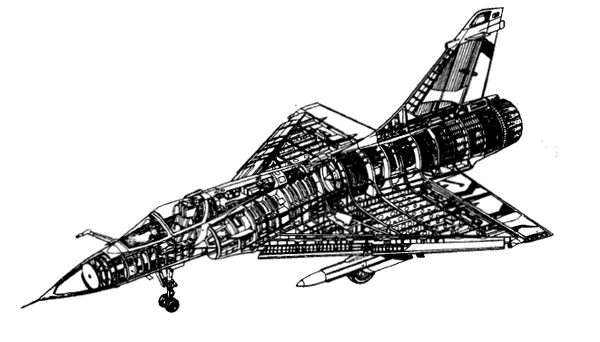 The French Dassault company designed a fourth generation air superiority fighter in the late 1970s as the Mirage 2000 with a MACH 2 capability. It got again a delta wing typically for Dassault fighters (after the excursion with the Mirage F-1 that had stabilizers). A single SNECMA M53 jet engine with 2 side intakes would enable over MACH 2.2 dash speed and standard it had 2 DEFA 30 mm canons fitted in the belly and various missiles. Systems would include fly-by-wire. 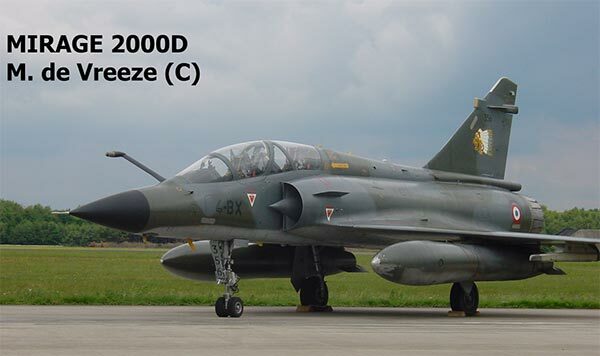 First flight was March 1978 and although deliveries to the French Armee de l'Air started in 1982, the first Mirage 2000C aircraft were not yet fully capable and fitted with a RDM "batch 1" radar. The later RDI radar was ready in 1987 (and the nose had a pitot tube). The standard systems included Serval Radar Warning Receivers (1 stub below each wing tip and the ECM fairing at fin leading edge and at rear of the fairing at the vertical fin base. Armaments could be Magic type 550 short range air to air missiles, Super 530 medium range air to air missiles (with RDI radar). External fuel tanks can be carried with one 1300 Liter central tank and 2 wing 1700 (?) Liter long range tanks. 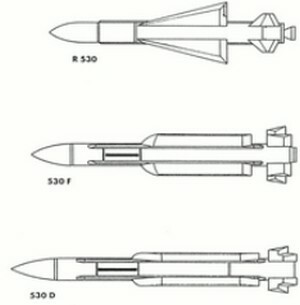 And for air to ground missions various bombs and rockets like the AS 30 air to ground missile. Later on a laser designator ATLIS pod could be fitted to guide laser guided precision GBU bombs. The standard Mirage 2000C had a wing span of 9.13 m and an overall length of 14.36 m. Empty weight was about 7500 kg and a max MTOW of 17000 kg. Ejection seat was the Martin Baker mk. F10Q seat made under license by SEMB. 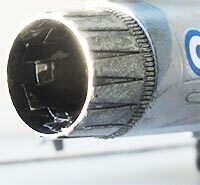 An in-flight refuelling probe could be fitted in front of the windscreen. 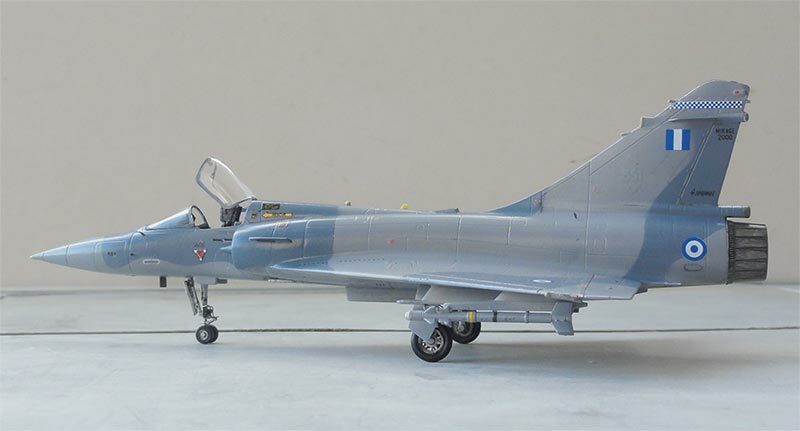 A two seater was also developed, the Mirage 2000B trainer and it was about 19 cm longer and I think it had no DEFA canons. Later followed the two seater Mirage 2000N (Nuclear) to deliver a 150kT or 300kT nuclear weapon with the ASMP (Air-Sol Moyenne Portee) stand-off missile and CSF Antilope terrain following radar. A Sabre ECM system was installed in the lower rear tail bullet and Spirale decoy system. A conventional two seater based on the -N was the Mirage 2000D with first flight in 1991 and also aimed at ground attack missions with an Antilope terrain following radar. Later on, Mirage 2000 aircraft could be upgraded, known as the Mirage 2000-5 series. The RDY radar was fitted (without a pitot tube on the nose, with pitot on the nose sides) and additional self defense systems, including chaff, additional ECM and RWR. On the vertical tail, the smaller anti-collision lights were moved and 3 DCS (Defensive Counter Measures) additional smaller antenna stubs fitted for these systems. On the wing tip, onto the existing RWR stubs additional smaller ECM antennas were installed. Aft of the inboard wing trailing edge at each fuselage side an Alkan chaff dispenser could be fitted as well. Other upgrades possible are a "glass cockpit" and capability for later generation "beyond visual range" MICA intermediate air to air missiles that works with the RDY radar. The first MICA missiles became operational mid 1990s with an adapted launch rail and small uplink antenna on the tail leading edge. Also the Matra Super 530F missiles could be fired. 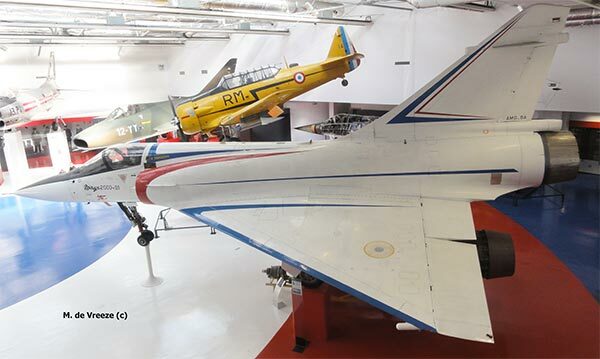 The French Armee de l'Air got over the years at least 124 Mirage 2000C aircraft, some 75 Mirage 2000N and 86 Mirage 2000D and 37 upgraded Mirage 2000-F with the total growing to over 300 aircraft. 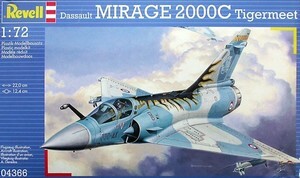 The Mirage 2000 was also exported, with the basic single seat version being the Mirage 2000E with modified RDM radar. The Mirage 2000 two seater was also offered with the Antilope radar. 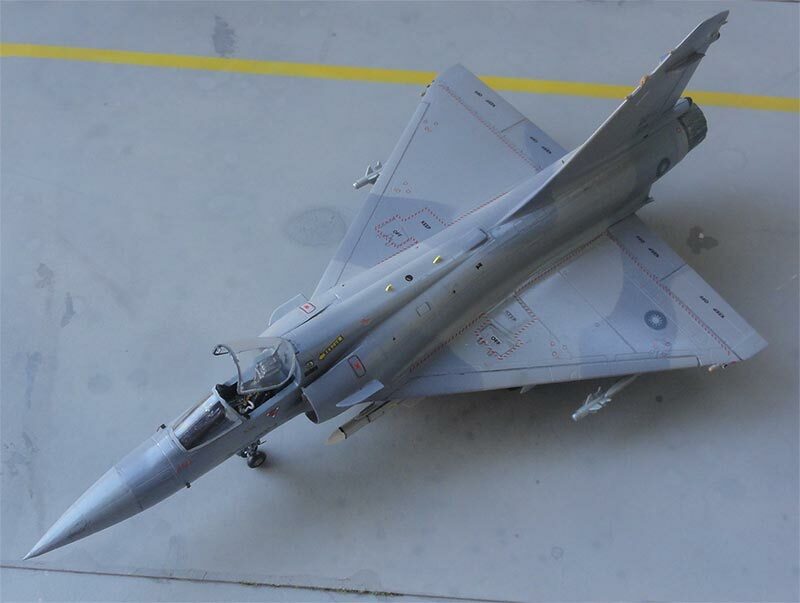 India ordered about 40 Mirages as Mirage 2000H(industan) called "Vajra", with first delivery in 1985 including often the ATLIS pod for ground attack missions. Additional aircraft were delivered later on. Peru got 10 Mirage 2000P and 2 -DP trainers that were not delivered earlier than end 1986. It appears a modernization program was started in 2009. The United Arab Emirates (UAE) ordered in the 1980s first 36 -E aircraft including reconnaisance RAD versions with the cameras fitted in pods. Delivery was disputed and started not earlier than end 1989. Some flew during the first Gulf War at operation "Desert Storm" in February 1991. Later on in 1998 additional modernized Mirages followed. They have also for strike missions additional equipment and can fire also Sidewinders. 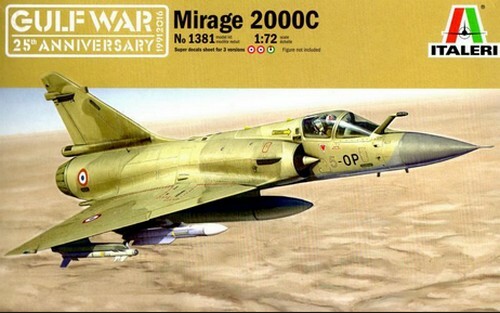 Overall over 60 Mirages 2000 were acquired by the UAE. 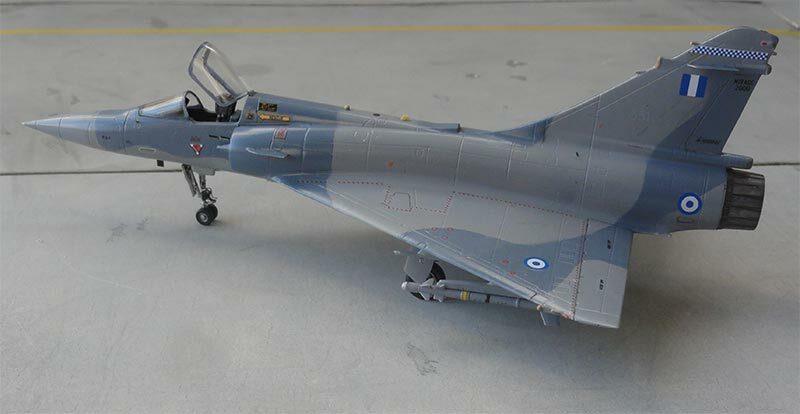 Greece acquired probably first some 17 Mirage 2000EG and 2 Mirage 2000BG two seaters with first delivery mid 1988. 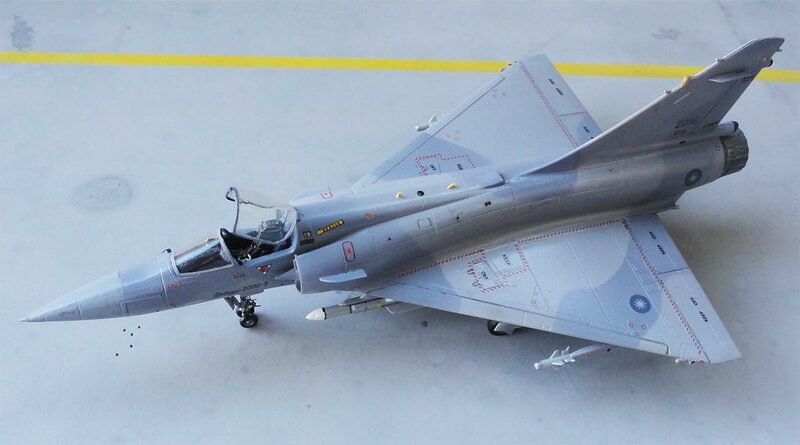 Later in the 2000s some 25 additional modern Mirage 2000-5 were delivered and existing aircraft also often upgraded to 2000-5 mk 2 standard with Spirale chaff and ECM. 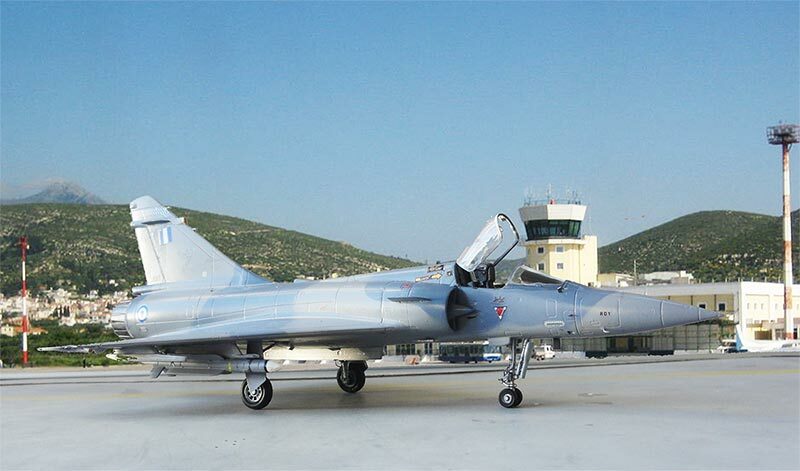 Main Hellenic air base for the Mirage 2000 is at Tanagra. Taiwan also ordered for their air force (ROCAF) modern Mirages with some 48 Mirage 2000-5EI and 12 2000-5DI two seaters obtained from 1997. They were only equiped for air defense and had no air refuelling probe installed. Magic and Mica missiles can be deployed and special pods with DEFA 554 canons that can be fitted onto the unarmed two seaters. ASTAC ELINT pods can also be fitted. 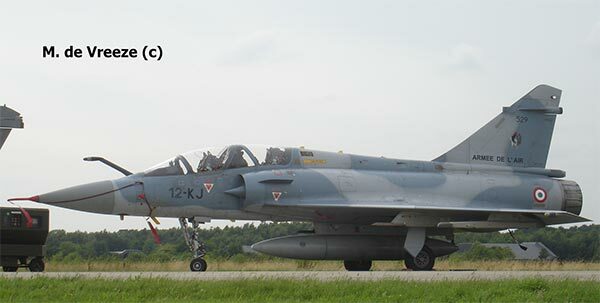 Qatar acquired in the 1990s some 10 Mirage 2000C and 2 Mirage 2000B trainers. They appear to be MICA missile capable as well. 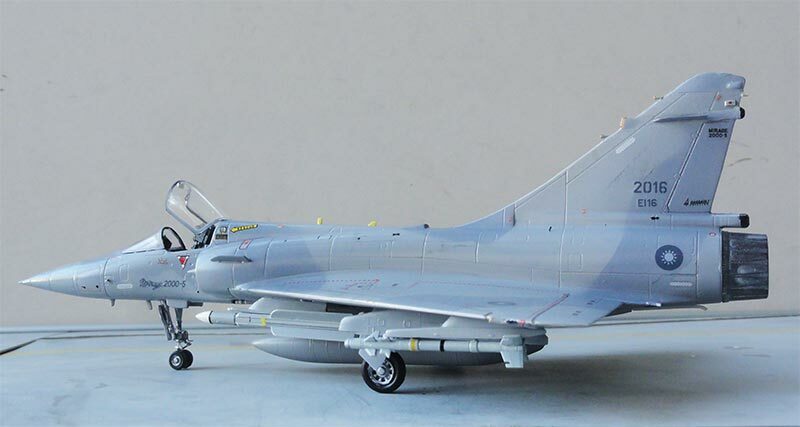 Brazil that wanted new fighters and was in the process of a great fighter order, also got a small fleet of some 10 Mirage 2000C and 2 Mirage 2000D in 2006 that were ex- French Armee de l'Air aircraft. They were used for air defense from Annapolis but they were withdrawn in 2013. 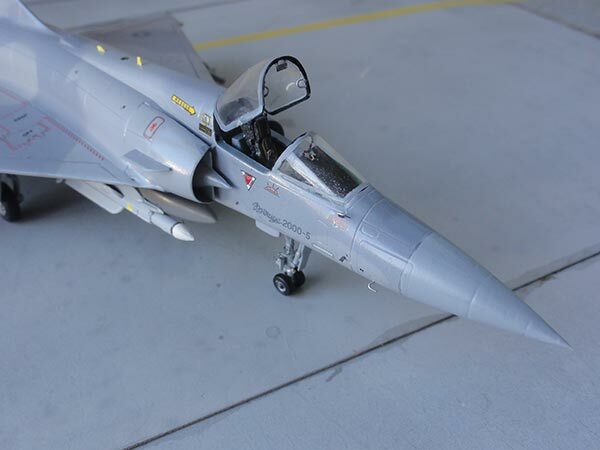 (The new fighter program dragged on for years and it appears that finally in 2014 some 36 Saab Gripen New Generation fighters were ordered with air frames to be license manufactured by EMBRAER in Brazil; this order is still being processed). Nearly 600 Mirage 2000 aircraft were manufactured in total until 2007. The French Armee de l'Air used half of these. Many French aircraft are replaced by the new Dassault Rafale. Early 1/72 kits were from Heller in 1979 and Airfix of 1990. 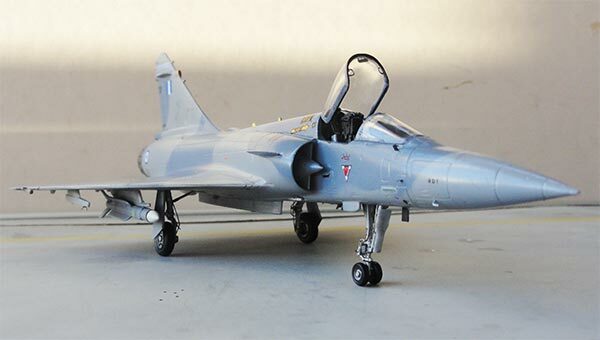 In 1/72 scale Italeri released a Mirage 2000C kit in 1992. This kit with no. 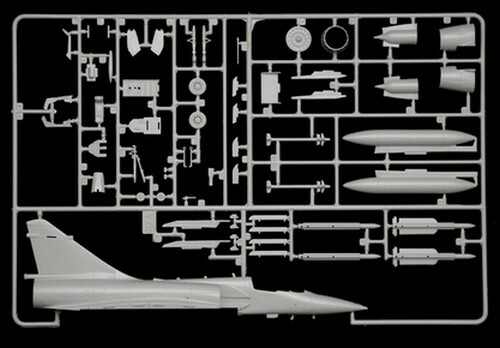 #012 has in light grey/blue plastic about 50 parts in 2 sprues for the aircraft. 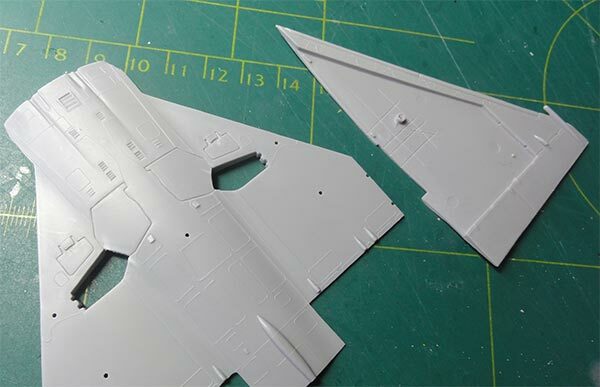 A clear sprue has the windscreen and canopy. The kit panel lines are engraved and look good though a bit soft. - a number of probably Durandal anti-runway bombs ? (never seen before). The Magic missiles are rather crude. 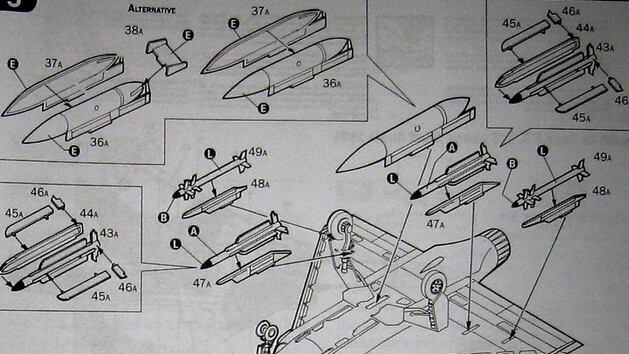 I found better missiles in the "Special Hobby Mirage F-1" kits and these will be used as much as possible. 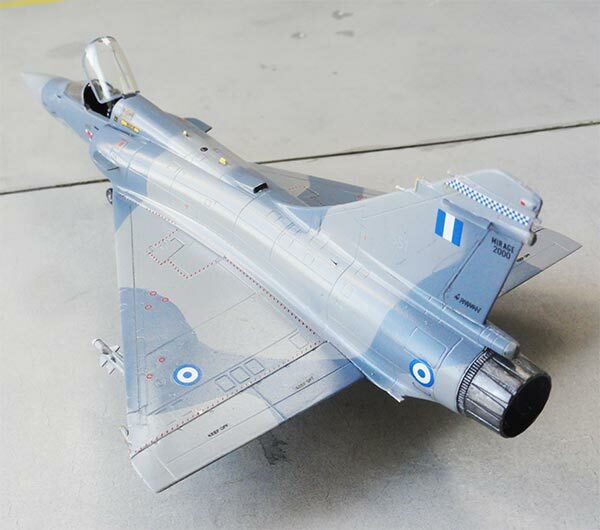 (2) Greece Hellenic Mirage 2000C of 331 Mira as based at Tanagra in 1991, in a medium- and lighter blue scheme. The roundels look "too light" blue. (B) Mirage 2000C of United Arab Emirates Air Force, also base at Al Ahsa base in 1991 in a desert brown/sand camouflage. NOTE: the UAE roundels with green disks were on my set a bit "off set" printed unfortunately. (C) Mirage 2000C of the French Armee de l'Air, EC 2/5 "Ile de France" based at Orange in 1990. No instrument decals are provided but raised enscribing on the panel. 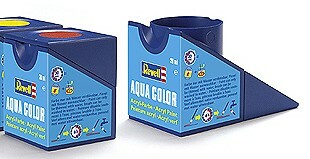 This very same kit also appeared again in Revell kits such as in 2004 with no. 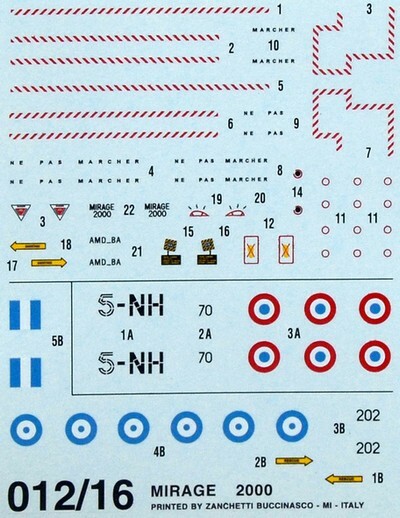 #04366 with decals for just one but very nice Armee de l'Air EC 5/330 at Mont de Marsan but in a Tiger scheme. 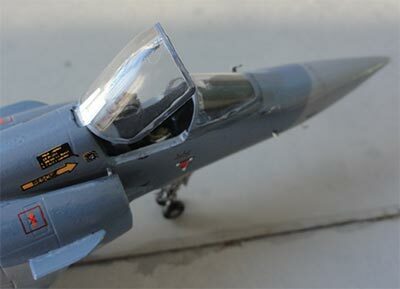 In a twin model Revell gift set #05709 in 2009 it appeared again combined with a RF-4E Phantom with a Tiger scheme. 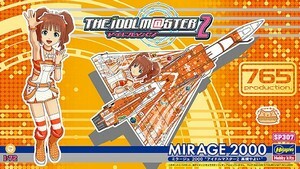 It appears that even Hasegawa released this Italeri mould in Japan as kit in a sort of fantasy "Idol Master" edition in 2012. 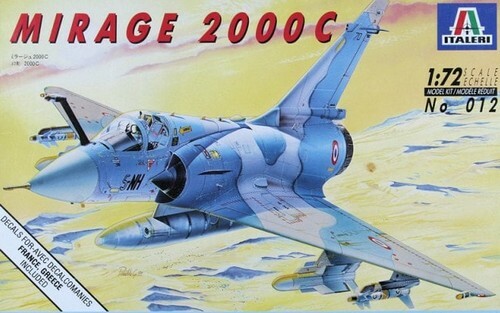 Italeri also issued a two seater Mirage 2000D kit (#023) in 1993, which I never purchased. But this kit repopped in a Revell box as kit #04893. Many of these kits will be made and presented in this modelling report. 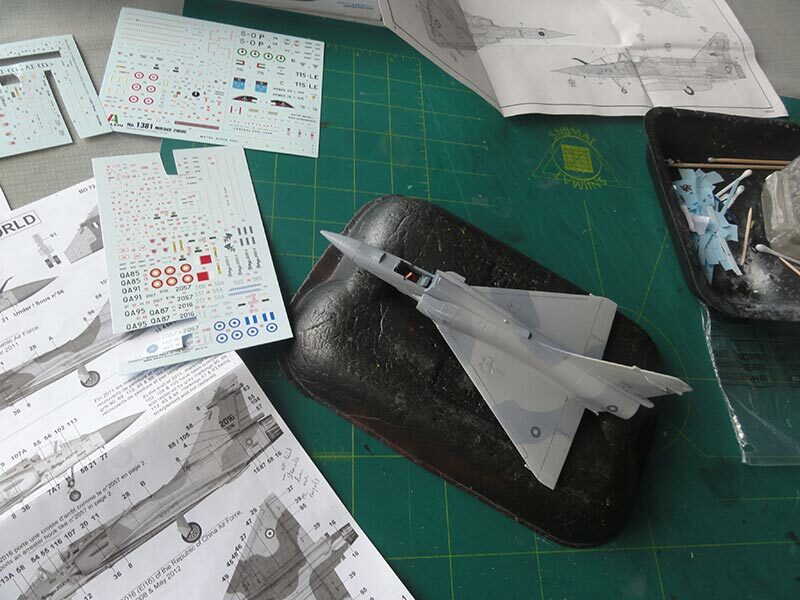 A few of these Mirage 2000C single seater kits (#012 or #1381) will be made. 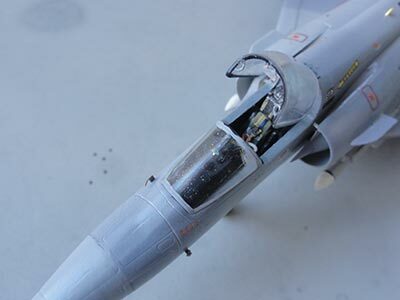 The kit parts represents an early generation Mirage 2000C. On each wing tip a Radar Warning Receiver (RWR) sub is present and on the vertical fin a RWR and ECM fairing. The wing slots for the pylons are moulded open in the kit. 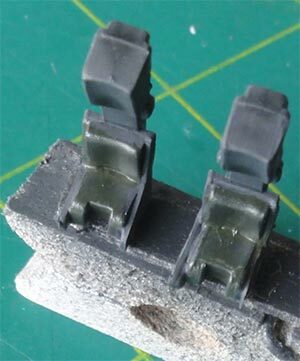 Should you wish a clean Mirage model without pylons, you will need to close these with strip and putty. Harnasses from tape and bit of metal were added as well. Note that more seats are shown here as I had more kits to make. 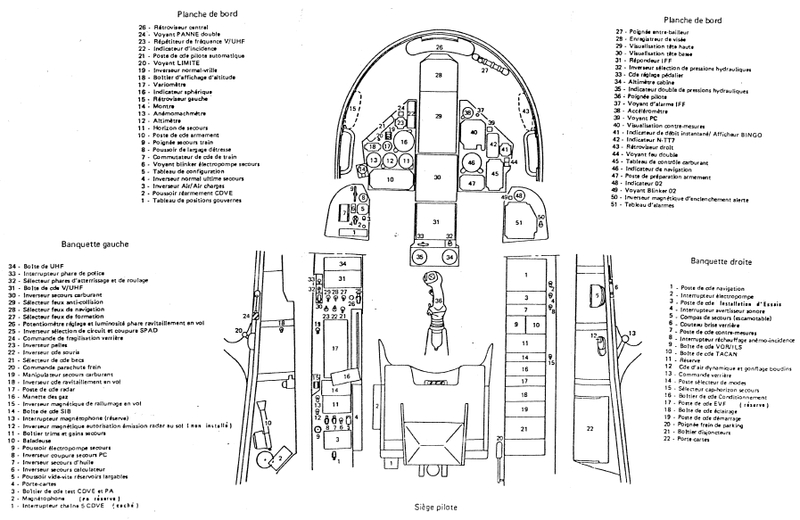 On dual two seater Mirage 2000's the front seat has 2 additional brackets on top (seen in the seat shown at left). Inside the cockpit for detail I added a few bits of scrap plastic and added instruments using decals from the decals spares box. The windscreen and rear canopy are separate parts so the canopy can be set open. Add weight in the fuselage nose just in case to prevent "tail sitting". I pre-painted / airbrushed some parts while still in their sprues for easier handling. The jet exhaust as per kit is a bit undeep and better made deeper. I used thin metal foil that was rolled in a tube. 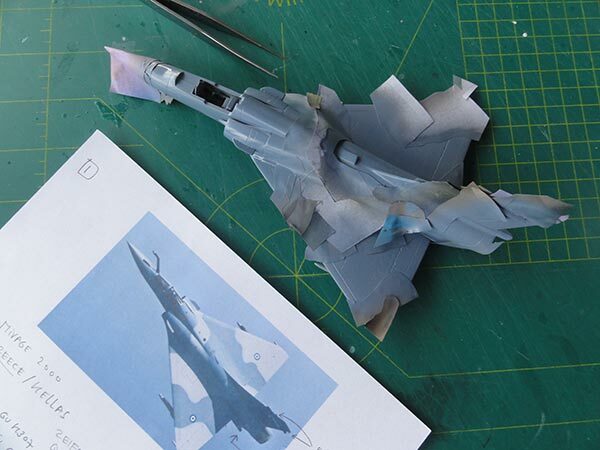 The end sections were cut in and folded, suggesting additional detail of the afterburner. This improved the look of the exhaust a lot. At the front the flame holder part #9A was used. This improved exhaust and pipe can be set in place in a later stage through the gap. The wing leading edge slats are inscribed a bit too long. The engraving runs well beyond the RWR wing tip stub. I inscribed the end about 2 mm more inboard and filled the panel. The wing undercarriage bays are a bit simplified, I only inscribed some detail inside the "roofs". 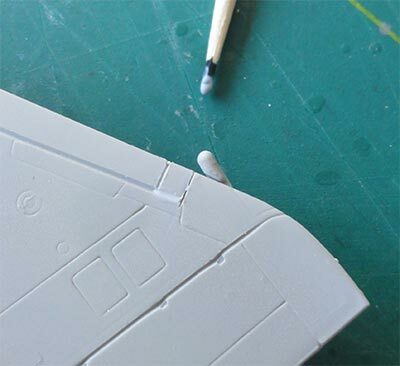 The wing-fuselage upper joints requires putty/ filler. The lower wing fuselage joint some putty and sanding as well, so better install the fairing #35A and canon barrels much later on. The spine and tail leading edge was also filled. The intakes fits much better when sanded at their mating surfaces. I added also 2 tiny fairings from scrap situated aft of the main gear bays and drilled an outlet hole near the aft fairing. 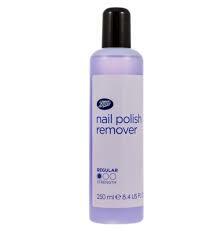 Filler / putty can be removed WITHOUT SANDING in many situations with plain Nail Polish Remover from the drug store. The one without Acetone is best as it avoids etching the softer plastic. 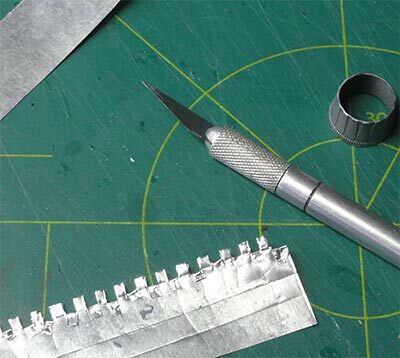 Remove any putty ridges with a cloth dipped in remover, this is an easy job. 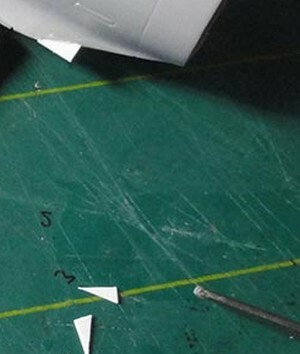 The intake vanes (parts #21A) should be set at a slight angle and fit better when trimming their lugs, same with the vertical fin VOR antennas #22A. I also added a very tiny 1 mm strengthening plate at the top of each intake between intake and fuselage side running over the air flow gap. Better also fit these smaller parts at a much later stage. Before added the gears and smaller parts, better first that a model is given its paint scheme. Canopy and windscreen frames can be hand painted in the appropriate colour(s). When painting is done, finishing is done with the landing gears and so on. Please note that the main gear legs #30a and 32A are to be set tilted a bit, the wheel and tyres and their doors #33A and 34A being almost vertical. 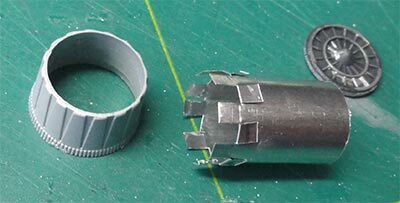 The DEFA canon barrels #27A are rather thick, I trimmed them with a knife. 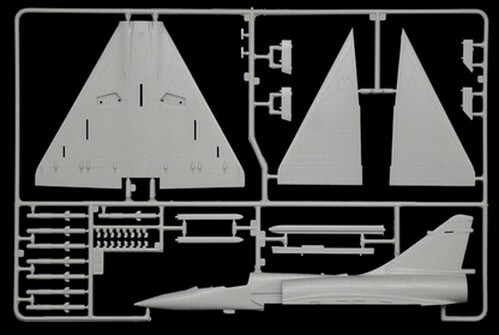 The smaller antennas under the nose and fuselage spine may vary depending on the version and air force scheme desired. And for modernized Mirage 2000 models add additional antennas and ECM / RWR from bits and pieces (will be described for each model made). The first Italeri kit #012 was made in the Hellenic scheme. I had a nice BERNA decal set BD 72-72 "Mirage 2000-5 of the World" and I wanted to make the modernized Mirage 2000-5EG version. On each wing tip not only the standard RWR fairing as per kit #28B was added but also a tiny extra bit in the corner for additional ECM. The central pylon was a longer one which I got from a Heller Mirage 2000N kit (will be described later on). Note that the standard central tank can also be used if desired. Next, an overall base grey coat was airbrushed to check for any errors on the surfaces and get a good undercoat for the camouflage scheme. I used Revell Aqua "steingrau" 75 acrylic for that, but any light grey will do here. (1) overall first a lighter blue-grey using Gunze Sangyo H307 acrylic (approx FS36320). (2) the darker blue pattern was a mix of 40% Gunze Sangyo H56 intermediate blue + 40% H1 white + 20 % Gunze Sangyo H323 Light Blue. Mixing the amounts can be done with a pipet. Make sure to keep some extra paint in a small closed paint jar for later retouching and matters like canopy frame painting. 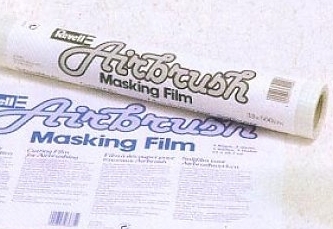 Masking was done with masking film from Revell before the darker colour was airbrushed with the Harder Steenbeck Infinity. The nose radar radome got a colour of grey H307 with a drop of black mixed in. Next was decalling. The applied paints are gloss but still to ensure "no silvering" (tiny air bubbles remaining below the decals) after decalling, I first airbrushed a few coats of Johnson Future/ Pledge Gloss. The Italeri kit decals for the Hellenic roundels look a bit too light blue. From the BERNA Mirage 2000 set better ones were used. As I had various kits, a lot of decals were available for example the NO STEPS and red dotted walkway lines. Just a few stencils and smaller texts are needed. I forgot the chaff fairings so these were also added from scrap plastic aft of the wing trailing edge on each side of the fuselage fairing. The small chaff cannister were fitted and actually contains the flares. The exhaust and jet pipe was improved as described earlier above. This modernized 2000-5EG version also had 3 additional small antenna / ECM stubs at the vertical tail: 2 at the leading edge and 1 at the fin trailing edge. (NOTE: I forgot to lower the anti-collision lights moulded on the vertical tail above the VOR antennas, they should than be set some 3 mm lower). The colours were applied with a paint brush. 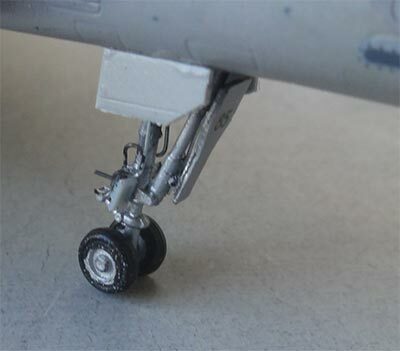 The model was further completed and now landing gears were installed. On both nose and main gear legs additional wiring was added as seen of real aircraft. The main legs are to be set at a bit of an angle, the wheels being vertical as well as the main ouside gear doors. Still some paint work to be done on the gears. Next came adding 2 small pitots aside of the wind screen, these were cut from etched metal. 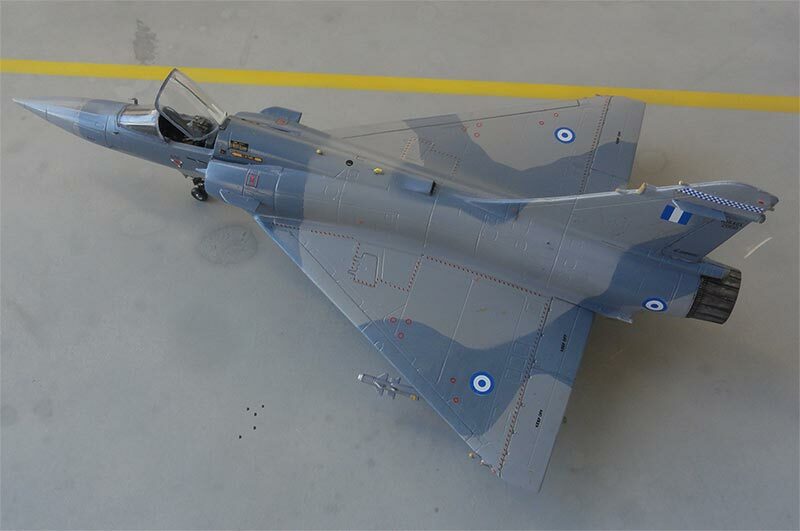 And than I found out to late that no nose pitot was fitted of this Greek Mirage so the nose got a bit of rod and sanded in a pointy shape. Better do this before painting off course! On the instrument coaming #13A I added from scrap with some wire and clear plastic a HUD. A better F10Q seat was set in place. The wind screen was fixed with white glue. The canopy was to be set open and got a mirror in the center inside the frame from REHEAT mirror RH156 set I had as well as 2 handles from thin wire. The canopy was kept in place with a small piece of metal foil at the hinge. Below the nose a different blade antenna was seen, so the kit part VHF antenna was cut away and a new one from card was fitted, it was painted black. On the spine the tiny IFF antennas were painted yellow and anti-collision lights painted on the wing tips and tail and given a dot of transparant Micro Kristal Kleer. Below at the starboard side on the nose a small probe was set in place from thin wire as well as 2 Angle of Attack vanes on each nose side. (No refuelling probe #55A was needed here). I wanted to fit better missiles so nice looking Super 530 and Magic missiles were retrieved from a Special Hobby F-1 kit (from which I also got a better seat). 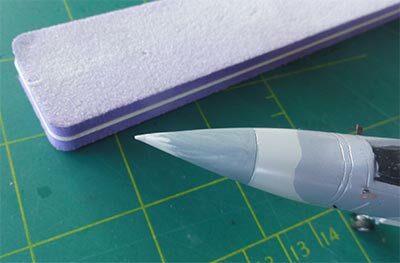 These missiles I gave grey Gunze Sangyo H307 colour with coloured stripes made from decals. The edges of flaps and ailerons and rudder were given a bit Promodeller wash and the slat lines and air brake outlines inscribed with a plain pencil. This looks good. At the model a gloss coat was airbrushed that consisted of Johnson Future/Pledge with some 10% Tamiya X-21 FLAT BASE mixed in; this to get a more mat effect over the overall model to protect decals and get an even sheen (shield off the clear canopy and windscreen while applying this coat). That completed this nice model! In Greece / Hellas military aviation started in 1912 with a few Farman biplanes. The air force Πολεμική Αεροπορία, Polemikí Aeroporía was established in 1930. In 1939 some 9 BLOCH MB.151 aircraft arrived just before the out break in France of the Second World War. Other aircraft at that time were the PZL P.24, Avro Ansons. During the war Hellenic squadrons were established with the British RAF with Hurricanes and Spitfires. In 1952 Greece became a NATO member and the first jet was the F-84 Thunderjet. Canadair Sabres followed and T-33 trainers. In 1995 the Thunderstreak came and in the 1960s the F-104 Starfighter and even in 1969 F-102 Delta Daggers. Northrop F-5's were also operated. All these years there were tensions with NATO member Turkey. 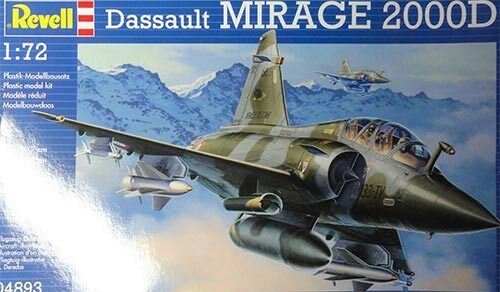 In the 1970s Mirage F-1 fighters arrived as well as capable F-4 Phantoms and in 1993 ex- US A-7 Corsairs. T-2 Buckeye trainers were also used along with T-6 Texan trainers. Mid 1988 the first Mirage 2000 aircraft were delivered and in 1989 the first additional General Dynamics F-16C and D Block 30 aircraft. More modern F-16 Block 50 aircraft arrived starting in in 1997. 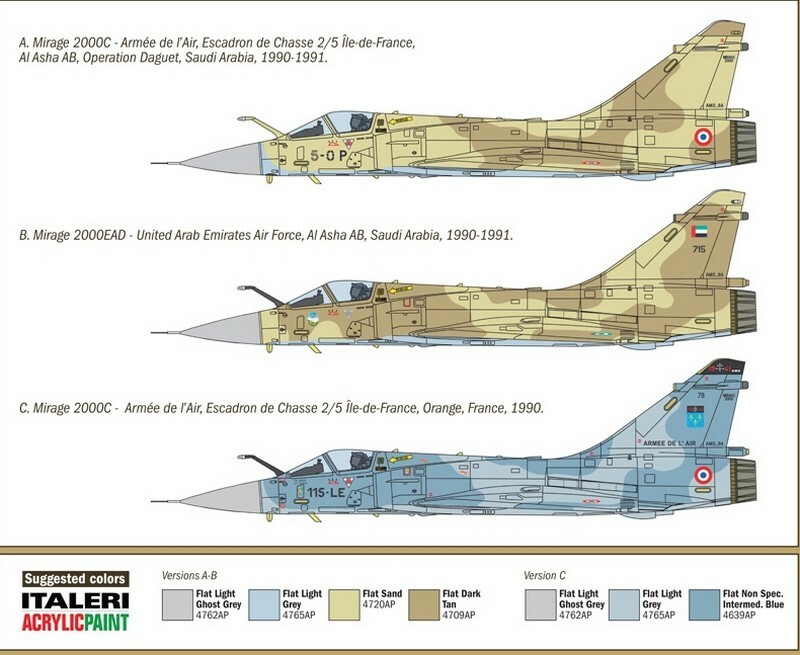 In 2004 a Mirage 2000 fleet upgrade started to 2000-5 standard and these were based at Tanagra AFB. Modern F-16 Block 52 (known as 52M) were ordered in 2005 with first delivery in 2009 and of which many are based at Souda Bay AFB at Crete, Larissa AFB and Araxos AFB. Various transports are C-27 Spartans, C-130's, and CL-215 and -415 water bombers and rescue aircraft. Another Italeri Mirage 2000C kit was made, now in a ROCAF Taiwan air force. 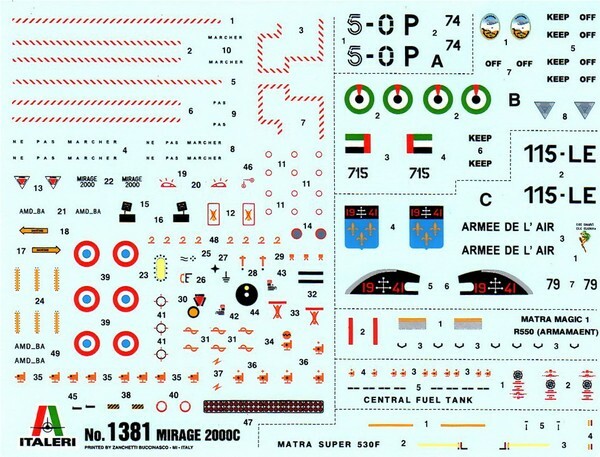 Decals are included on the Berna set "Mirage 2000-5 of the World" BD 72-72 for EI16. 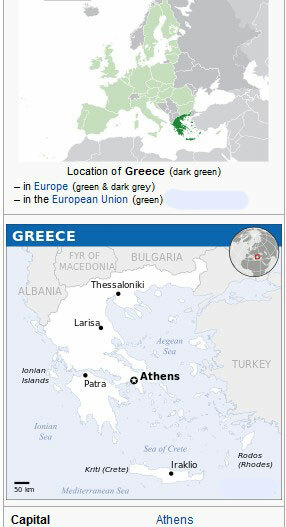 The model was made in a very similar way at the Hellenic / Greek Mirage described above. 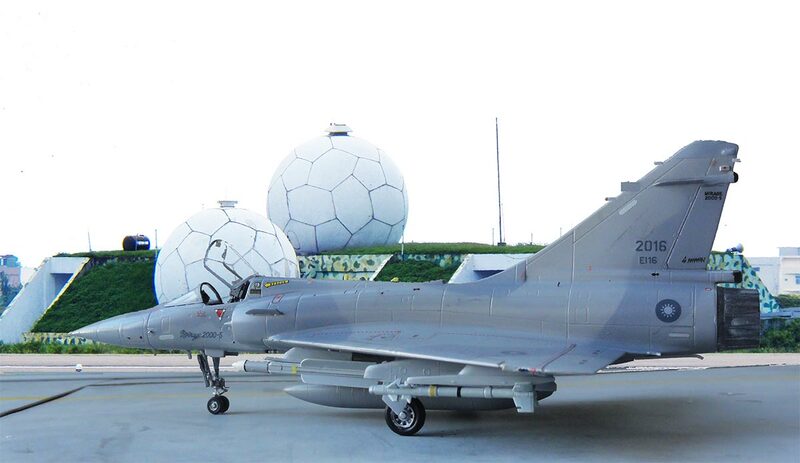 It is a modernized Mirage 2000-5Ei as used from Hsinchu base in Taiwan. 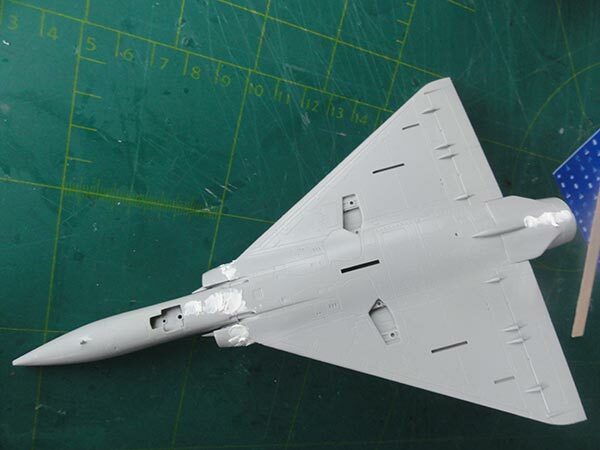 It got the additional antennas/ stubs at the vertical tail and chaff fairings with cannisters aft of the wing trailing edge. Also, additional tiny ECM stubs were added on the wing tips next to the standard ones. (1) overall first a light grey coat of a mix of 70% Gunze Sangyo H308 (FS36375) + 30% Gunze Sangyo H57 "Gray". (2) a mix of medium grey 55% Gunze Sangyo H308 + 45% Gunze Sangyo H56 "intermediate blue". 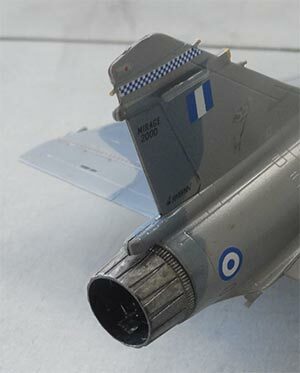 Finishing again was done as for the Greece Mirage model with better seat, open canopy, tail pipe, detailed landing gear and so on. 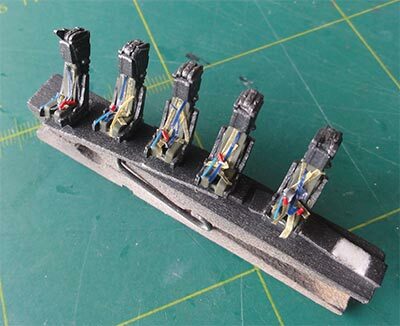 It has no nose pitot but pitot tubes on the nose sides, these were made from scrap etched metal parts. I also added 2 inboard pylons in front of the main gear bays. The pylons were made from scrap. 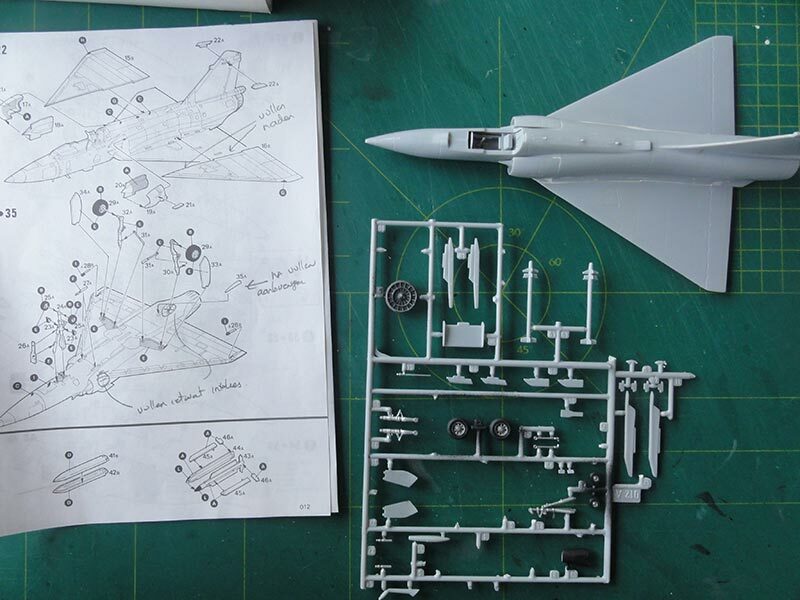 On these the better Special Hobby Mirage F-1 kit Super 530 missiles were added. The central tank was set in place with a better pair Magic 550 missiles from the F-1 at the outboard pylon. 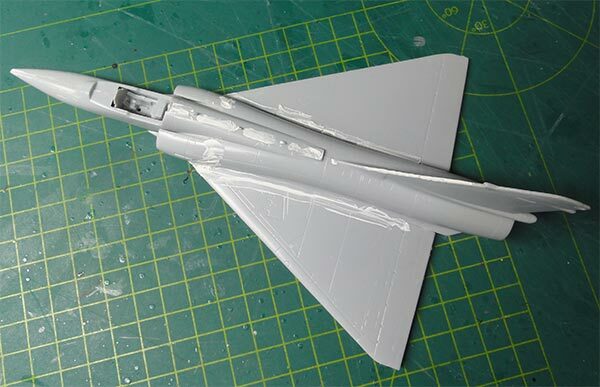 A final semi-matt-gloss coat was airbrushed with Johnson Future/Pledge with some 10% Tamiya X-21 FLAT BASE mixed in. Shield off the clear canopy and windscreen while airbrushing this coat. 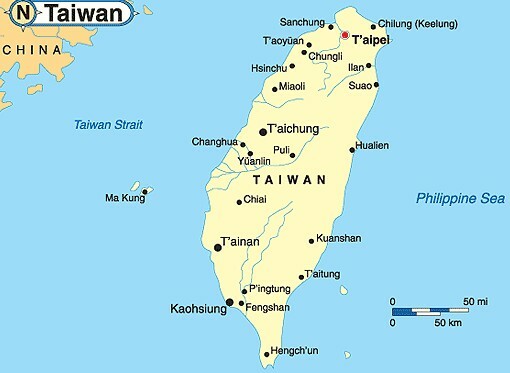 Taiwan, the large island off the coast of mainland China was a sort of democratic area established in 1912. The larger region saw many battles with Japanese occupation of Northern China Mantschuria with later the Second World War. After the end of the war conflicts remained with the Chinese civil war with mainland China becoming a Communist continent. But from 1949 Taiwan was able to remain the only independent area with leadership of general Chiang Kai-shek. This has always given tensions with Communist China. During the Cold War wars were fought in Korea and Taiwan (ROC) was strongly supported by the USA. The armed forces air force got American aircraft such as the F-104, F-5 and T-34. The local industry also developed some aircraft, such as the AIDC AT-3 jet trainer of which development started in the 1970s. 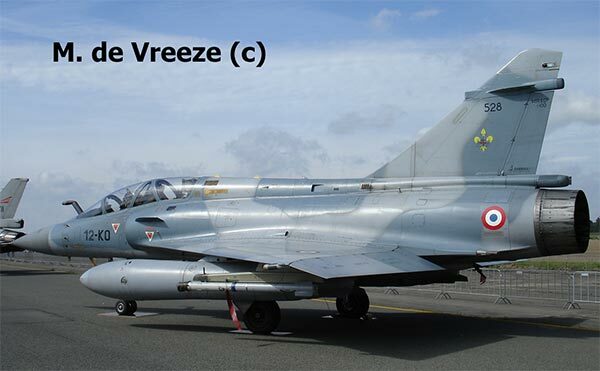 More recent aircraft types are the F-16 but also modern French Mirage 2000-5 with deliveries from 1997. 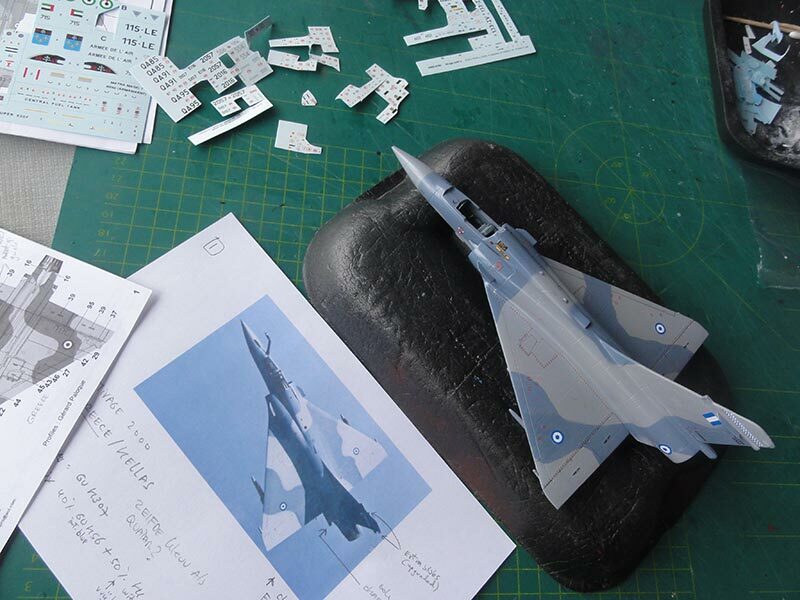 The latest local designed aircraft is the F-CK-1 Ching-kuo "IDF" multirole fighter. The army and navy also use a substantial fleet helicopters and aircraft like the P-3 Orion and still even S-2 Trackers. 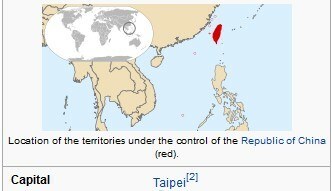 Still as of today, Taiwan is considered by Communist China to be their province with still difficult relations. Taiwan got over 50 modern Mirage 2000-5 fighters with first delivery in 1997.